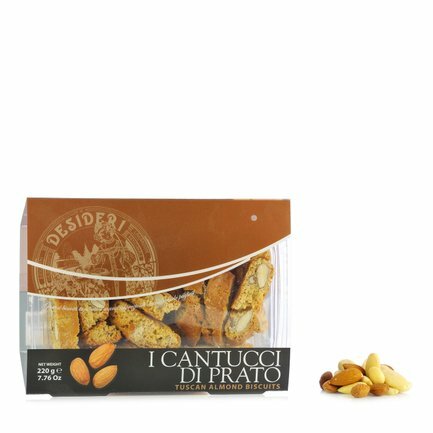 Classic Tuscan Cantucci di Prato biscuits are divinely sweet, entirely handcrafted and made even more irresistible thanks to the addition of sweet Apulian almonds. The variety lovingly crafted by Famiglia Desideri are traditionally savoured with Tuscan Vin Santo to bring out faintly bitter notes of the almonds. Ingredients “00” type soft wheat flour, almonds 30%, sugar, eggs, wildflower honey, vanilla flavoured baking powder, natural orange flavouring. ALLERGENS: milk, nuts, eggs, flour, vanilla For more information on product labels, please contact our Customer Service department. The information on the labels of the products may vary for reasons beyond our control, therefore, there may be discrepancies between the information on the site and that on the products delivered. Please always check the information on the product before consumption or use. The Desideri family has been producing confectionery merchants since the early 1900s, when Stefano Desideri - great grandfather to Giacomo and Luca - travelled around the villages in the Tuscan countryside selling delicacies in local fairs and markets, an activity that was eventually replaced by his own production of Cialde di Montecatini wafers. Since that time, the recipes of traditional Tuscan confections have been handed down unchanged from generation to generation. A century later, Giacomo and Luca, who share their grandfather's love of confectionery art and their Tuscan heritage, are pursuing the tradition with the artisanal production of exceptionally wholesome Wafers, Brigidini, and Cantucci biscuits, making the absence of any form of added colourings and preservatives one of the firm's core values.